Is your garage overflowing with junk? Is your car perpetually parked on the driveway or street? Can you even step foot in your garage without seeing some pest skirt out from under one of the many boxes you have stored there? It’s time for you to do some cleaning and take control of your space and turn your garage back into what it was meant to be, instead of the cluttered space it has become. Follow these simple tips to get your garage back on track. There isn’t a lot of room on the floor of a garage, so it’s important that you utilize the wall space in getting organized. Pegboards are perfect (and popular) for hanging lightweight gardening tools, biking gear, and sports equipment. Use individual, personal lockers to organize toys and larger sports gear. Magnetic strips on the wall also work great for storing small tools like screwdrivers, wrenches, pliers, etc. Oil leaks and other spills from slippery chemicals should be cleaned up as soon as you notice them. Not only do they pose a hazard, they can leave dark stains on your garage floor. There are a few household items you can use to get motor oil spills off of concrete. Cat litter and sawdust do a great job of soaking up excess oil. Leave them on the spill overnight and sweep it up in the morning. You may need to repeat this a few days in a row to fully remove excess oil. After the excess oil has been removed, you’ll want to work on cleaning up the stain. Soda pop works well if left overnight and washed away in the morning. You can also use dish detergent, WD-40, and oven cleaner, with each being independently applied and washed away 5 minutes later. How do grocery stores make room to fit all of the products they’re trying to sell? They assign every item a spot in the store, and that is exactly where you can find it every time you look. Use this same logic in your home storage areas. Whether you’re looking to store Christmas decorations, old memorabilia, or a favorite hobby you haven’t had time to pursue recently, give it a distinct space in your garage to occupy. Put groups of items in their own plastic bin (cardboard boxes are an ideal hiding spot for rats and cockroaches) and clearly mark the bin with what’s inside. For items that you don’t use frequently, like decorations, store them on a higher shelf. Don’t give in to the temptation to pile bins closer to the door, just out of laziness. Stick with the habit of keeping boxes in their designated spots until it becomes second nature to do so. There are plenty of hazards in your garage that you need to be aware of, whether the space is well-organized or not. First, if the items in your garage are not organized and put away, they do pose a tripping hazard, particularly extension cords. Ensure that all extension cords are wrapped up and hanging on a wall hook. Next, as previously mentioned, clean up any hazardous spills to avoid anyone slipping or animals or children coming in contact with it. Once the spill is cleaned up, make sure that any chemical containers like motor oil, antifreeze, and paint are properly sealed in their original container and stored out of reach of children. Consider using a locked cabinet or high shelf for chemical storage, protecting children and pets from getting into mischief. While the chemicals you store in your garage may be necessities, they can pose a fire hazard as well. Regularly check your smoke detectors and carbon monoxide alarms to ensure that they are functioning properly. Additionally, every garage should have a fire extinguisher for emergencies. 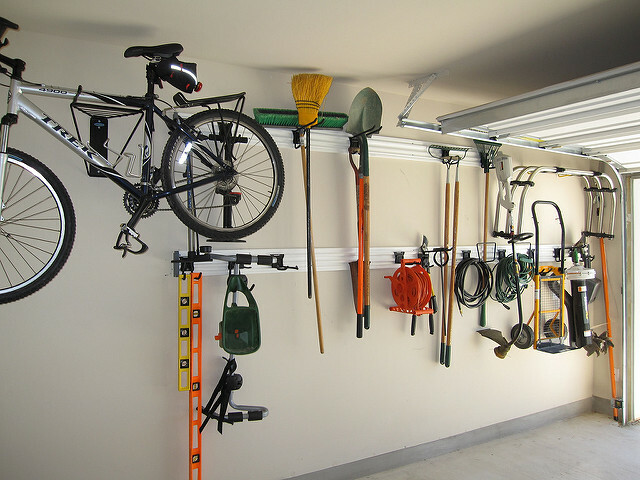 Follow these tips to reclaim the space in your garage. If you see any pests during your work, call Edge for pest control near you. EDGE provides both residential and commercial services including: Pests, Lawn, Mosquitoes, Rodents, Fleas & Bed Bugs. Click HERE to talk to an EDGE expert today.